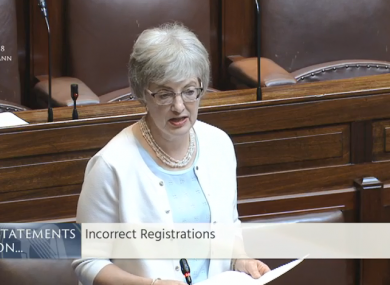 MINISTER FOR Children Katherine Zappone has said the State will never be able to contact some of the people who were adopted and whose births were illegally registered in this country. Speaking in the Dáil today, she said it has been confirmed that the births of 126 people from St Patrick’s Guild were registered illegally. In these cases, a baby who was adopted was registered as the biological child of the adoptive parents. There is no adoption order for these individuals and Zappone said there was a “deliberate failure” by those involved to keep records. Of the 126 cases, 79 have never been in contact with St Patrick’s Guild or with Tusla, the child and family agency, and in the remaining cases there has been some contact by the person or a relative. Tusla is also examining a further 16 cases where there is not enough evidence at this point in time to determine whether an illegal registration took place. She said the Adoption Authority is aware of 140 cases where suspicion about illegal registration must now be revisited. Zappone said there will be people the State “will never be able to contact” as files may have been deliberately designed to conceal identities, or people may be deceased. “A cruel and inhuman past rises up again – with a vengeance – in Ireland. “It is about the shaming of women, it is about the shaming of mothers, it is about how this shaming has been inherited by their children. Zappone said “lies, secrets and silences” continue to block access to information to one’s identity and to restorative justice. She said she met some people at the start of this week who were impacted by the illegal practices surrounding birth registration and adoption practices. One of the women, a survivor of Bethany, spoke about her arduous and painful search for her birth mother, and how her desire for information was blocked at every turn. One day she finally found her, buried in a pauper’s grave. With great dignity and courage, she purchased the grave, as an act to claim identity without shame, and to do the right thing where others had failed. Tusla has handed over ten sample files to gardaí for their investigation into the illegal birth registrations. The minister has also appointed an independent reviewer, Marion Reynolds, to oversee a further analysis of relevant records held by Tusla and the Adoption Authority. Reynolds is a former Deputy Director of Social Services in Northern Ireland. She has been asked to report back to the minister within four months. “At the centre of all of this are people who were lied to and denied information about their true identity,” Zappone told the Dáil. Email “'Lies, secrets and silences': Some people with illegally registered births will never know”. Feedback on “'Lies, secrets and silences': Some people with illegally registered births will never know”.